With U.S. eCommerce sales reaching $105.10 billion in the second quarter (which is a 16.3% jump from the $90.4 billion in the second quarter of 2016), there is plenty of opportunity for eCommerce merchants to get their slice of the holiday pie. eCommerce stores have really raised the bar, in regards to customer conversion promotions, and often will throw in sweet extras like steep discounts and free returns to really seal the deal—so, what else can you do to increase conversions this holiday season? Luckily for you, we’re here with advice, and we’ve put together a few strategies that will help you reach your goals this season. If you don’t want your emails to get lost in the avalanche of promotional materials that go around during the holiday season, you have to make sure they really stand out. Don’t be discouraged by this rise in competition. Surprisingly, customers don’t seem to mind the large number of emails, with open rates actually increasing steadily in the lead up to and during the holiday season. Take advantage of this increase by making your content relevant and eye-catching, and you’ll be substantially boosting client eCommerce conversions. Keep in mind that it’s not only the eCommerce sites getting ready. Shoppers everywhere are eagerly anticipating what sorts of offers the world has on tap. One of the best ways to do this is to highlight a popular product along with some excellent value-driven copy. Your message should be clear and simple, and your email recipients should be strongly encouraged to complete the purchase then and there. Additionally, you can help spread the festive cheer (and subconsciously prime your email recipients for shopping) by utilizing holiday-oriented colors and messages. This includes everything from holiday-themed banners and writing to using a few of the holiday-oriented emojis available to you. A phenomenal way to drive word of mouth is to offer free gifts with purchases. Many campaigns that have offered free gifts as part of their holiday exclusive offerings not only were able to increase their sales but also generate new word of mouth. For example, you could launch a referral-based campaign program where shoppers can send one free gift to one of their friends via email once they complete their purchases. However, if you do want to give a gift to drive sales, you have to ensure that your gift is worth receiving. Too many customers are baited to purchase something by eCommerce platforms offering a free “gift,” only to find out this “gift” is a 10% coupon. There’s nothing wrong with offering coupons as gifts, but you should at least make it enticing enough to not chip away at your brand. Ad retargeting can be particularly effective during the holiday season because shoppers are likely looking through multiple different tabs for multiple different products for multiple different people at any single time. 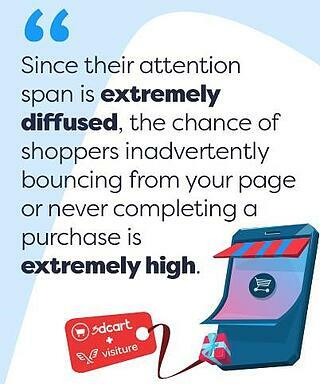 Since their attention span is extremely diffused, the chance of shoppers inadvertently bouncing from your page or never completing a purchase is extremely high. 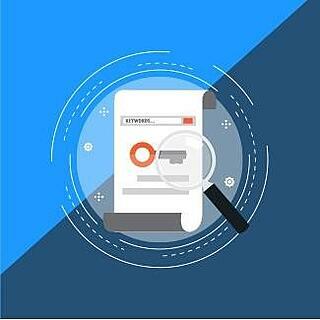 Ad retargeting allows you to get a second or third shot based on their behavior. For example, if shoppers abandoned their carts, you could send them ads that remind them to complete their purchases (or include an extra incentive like free shipping, or an extra discount if they complete the purchases within X amount of time). If the shoppers were spending more time than average looking at products on your site, you could retarget them with ads based on those specific products. Ad retargeting not only makes it possible to get a second or third opportunity, it’s also much more cost-effective since the shoppers are already aware of your brand and the products they’re seeing pop up again and again. Creating curated sections for particular types of people can be an extremely effective way to drive sales while also letting shoppers know you get them. Being able to click on a single category page can make shopping much easier, and the more of the guesswork and thinking you eliminate from the shopping process, the less shopping fatigue your shoppers will have. The less mental exhaustion they have means the higher possibility of them not abandoning checkout and completing their purchases. “Popular for X” sections are essentially a gift for shoppers who are shopping for other people. Chances are a father shopping for his 12-year-old daughter might be a bit far removed from what 12-year-old girls are into, and having everything in a “Popular for Tweens” section could make the shopping process much easier. Let the creative juices flow. Your shoppers will not only appreciate the fact that these categories are filled with extremely relevant products, they’ll also view your brand more positively since you’ve taken the time to make some creative holiday-specific categories. When’s the last time you used your blog to drive sales to your eCommerce store? 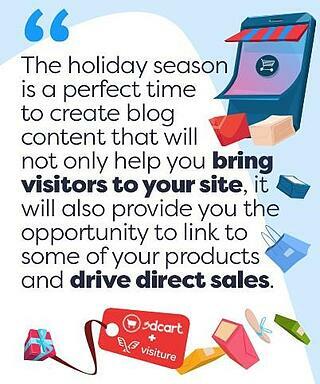 The holiday season is a perfect time to create blog content that will not only help you bring visitors to your site, it will also provide you the opportunity to link to some of your products and drive direct sales. Many merchants tend to get confused when it comes to their blog content, but, once you put yourself in your shoppers’ shoes, it becomes much easier. Just think about it: What are some types of articles that would be extremely helpful to you during the holiday season? How about a guide to shopping for shoes for your girlfriend? This type of post could go into detail about what to look for, popular brands, and the general price range you can expect, as well as a few great deals going on. How about a round-up of some of the hottest presents in 2017? This type of post can attract people who want to offer gifts that are trendy. Seeing them all on one list will make the shopping much easier. What about a post that goes over something as specific as “The Top 10 Timeless Classic Gifts for Guys in their 20s”? If you create an awesome blog post on this topic and run some targeted Facebook ads, you’ll likely attract a handful of shoppers. It’s important that you don’t make your blog posts overly promotional (unless that’s the goal of the blog post), so you can establish yourself as a helpful authority in the niche. These holiday-themed blog posts will not only help you during the holiday season; if you execute them properly, you could earn yourself countless emails for shopping throughout the rest of the year. The holiday season makes keyword targeting hypercompetitive, and many of the people already ranking for high-value keywords such as “Best holiday deals” or “Christmas gift specials” have already put months (or years) of effort into earning that valuable spot. Trying to compete for those keywords will exhaust your resources and detract from efforts that could yield you more substantial results. 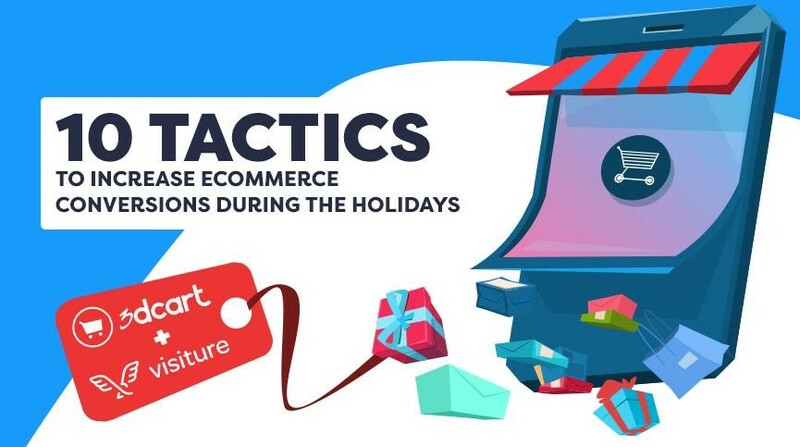 Many festive keywords aren’t very high priority throughout the rest of the year, leading many eCommerce stores to place their SEO efforts elsewhere. You can take advantage of this by targeting long-tail festive keywords such as “best Christmas gifts for the 25-year-old snowboarder” early on. When the holiday bells start jingling, people’s social media feeds become peppered with all sorts of enticing promotions and discounts. The only way to fight fire, in this case, is … well … with fire. Keep it simple. This isn’t really the best time to lace your site with little “Easter eggs” or surprise discounts and free items. The holiday shopping season can be a blur for most people, and you’ll be doing them a favor by explicitly stating your offerings. 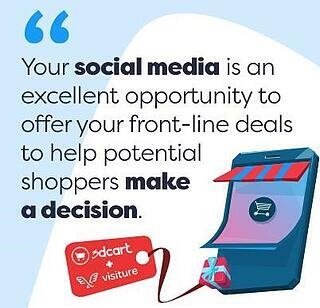 Your social media is an excellent opportunity to offer your front-line deals to help potential shoppers make a decision. Product-focused social media discounts could focus on one product at a time, offering a steep discount or another incentive to encourage people to purchase it. Store-wide social media discounts are aimed at attracting shoppers to your site using a store-wide discount or incentive such as free shipping. Many eCommerce merchants focus solely on acquiring new shoppers and leave their loyal customers in the cold. Don’t forget to nurture your email subscribers and former customers by offering them certain promotions to make them feel special. Your existing customer base is not only already familiar with your brand, they’re also more likely to buy from you again. While offering your loyal customers first-row seats to the same discounts you offer everyone else might be effective, it certainly doesn’t make them feel special. By going out of your way to show your customers that you value their loyalty by offering them additional discounts or other incentives like free shipping or free gift wrapping, you’ll encourage them to keep shopping with you in the future. Additionally, your current customers are more likely to organically spread the word if they feel like they’re getting a lot of value from your site. Imagine turning your existing customer base into an engine for word of mouth referrals! 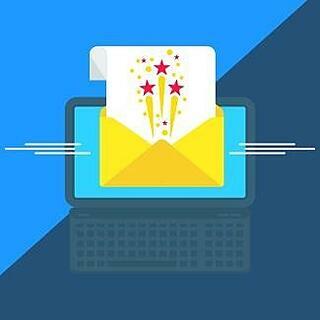 Free shipping is the number-one way to convert conversations to sales. Even if you increase the price of a product, if you offer free shipping, customers are more likely to make the purchase. It comes from people’s sense of value—when you don’t make customers pay for shipping, they feel like they’re paying only for a quality product, not the service of sending it. If you don’t think you can financially swing free shipping, you can try to find some sort of balance by incorporating it into product costs to help increase conversions. The lift that free shipping provides varies for each store, but the additional boost in conversions and revenue from offering free shipping could actually earn you a higher ROI than other marketing channels. If you’re terrible at gift wrapping, you’re not alone. Many of your customers will be dreading the gift-wrapping part of giving someone a gift this holiday season. It’s not as simple as it sounds. For many online shoppers, gift wrapping means either ordering or visiting a store for wrapping paper, tape, and even scissors—let’s be honest … can you find your scissors when you need them?—from what is usually a different store only to have to do the wrapping themselves. 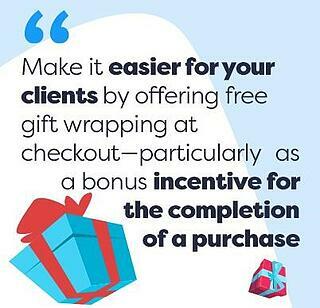 Make it easier for your clients by offering free gift wrapping at checkout—particularly as a bonus incentive for the completion of a purchase: Check out now and receive free gift wrapping! While the above tactics are a good start to increase eCommerce conversions through the holidays, they all require an element of creativity to really stand out. There are many varying ingredients that come into play for a successful eCommerce holiday strategy. View the holiday season as a science fair project where you’re running multiple different A/B tests to find what works best. Industry benchmarks and even lesser-known strategies might help you get some lift, but you’ll only truly gain an edge if you’re able to incubate strategies and tactics that are proven to work for your specific site in your niche.